Critics keep describing A War as, “ethically challenging.” I’m not sure that term means what they think it means… The conflict at the center of the A War is cut-and-dry: a Danish military commander orders a bombing that results in the deaths of a dozen civilians in Afghanistan; he gives the order because of his vicious “us vs. them” mentality. Anyone who finds the film “ethically challenging” might be susceptible to such thinking. 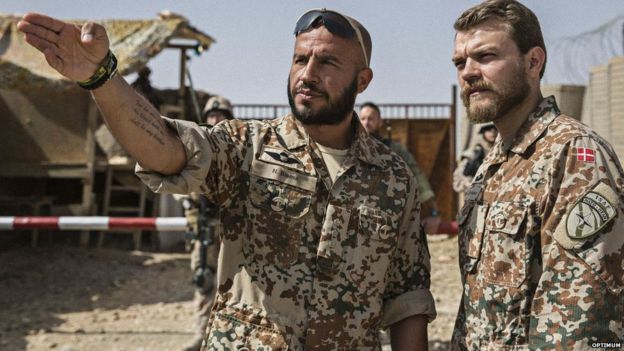 If London Has Fallen was an unabashed celebration of the “us vs. them” mentality that arises during wartime, director Tobias Lindholm vehemently condemns it with commanding officer Claus Pederson (Pilou Asbaek). An otherwise decent person, he is never presented as an outright bigot; however, it’s clearly much easier for Claus to play with the lives of Afghan people who don’t look like him, talk like him or act like him. However decent he appears to be, Lindholm doesn’t leave Claus’s moral shortcomings up for debate. Back home in Denmark, Claus’ wife struggles to care for their three children by herself. Maria’s (Tuva Novotny) daily life is revealed through underdeveloped asides that stop occurring just as they start to go somewhere. Awkwardly jumping back and forth between Claus and Maria means that the first half of A War is messy, but effective enough. It’s not until Claus returns to Denmark, to stand trial against the charge of a war crime, that A War becomes the best version of itself. Eventually, A War takes a sharp right turn into courtroom drama, reminding us that Lindholm was also the director behind 2012’s terrific negotiation-thriller A Hijacking. Despite the film’s other issues, scenes of Claus’ trial are rare cinema that makes you want to wrap your arms around it before planting a big sloppy wet kiss. A lot of that has to do with Soren Malling, A Hijacking alumnus, as Claus’ defense attorney. Malling was born to argue quietly and frankly. Charlotte Munck, as the prosecutor after Claus, is every bit as good as Malling, so the few moments when they’re allowed to spar absolutely sizzle. I really hope that some critics aren’t finding A War to be “ethically challenging,” because they can sort of forgive a Westerner for indiscriminately killing Middle Easterners, so long as he felt bad about it afterward…the precise mentality that the film is against. Yes, Claus is charismatic—he even does quite a bit of good—but the film makes no qualms about calling him a villain. Throughout A War, several characters admit that they would use any methods necessary to protect their own from the proverbial “them.” Lindholm never asks us to debate the logic of these confessions. Instead, he unequivocally shows us how thinking like that can prompt good people to do terrible things. Despite an iffy first half, A War eventually comes together as one of the better courtroom dramas that I’ve seen in years. You should definitely see A War but be weary of any “moral grey zones” you think that you might find.